How the different steps of juice processing and bulk storage affect the quality of orange juice. How oxygen gets into juice and its role in degrading juice quality and causing problems during operation. The removal of oxygen from juice is also discussed. Which microorganisms cause juice spoilage and what influence raw materials and cleaning procedures have on product contamination. Why and when pasteurization is carried out and the conditions needed for effective heat treatment. A good understanding of the properties of orange juice is required to design and operate processing plants that maintain high juice quality. The properties of fresh fruit and the initial processing conditions (during juice extraction) influence the quality of the end-product. Heat treatment of juice is essential for obtaining the desired product shelf life, but the process should be designed to minimize unwanted quality degradation. Bulk storage conditions that minimize changes in quality are essential because juice may be stored for a year or more. Air in juice leads to reduced product quality, foam during deaeration and filling, and uneven distribution of floating pulp (if any) in packages. It is therefore essential to prevent air from entering product streams, and to remove it before filling and packaging. As a high-acid product, microbial growth in orange juice is limited to yeasts, moulds and acid-tolerant bacteria. Yeast fermentation is the prime cause of microbial spoilage in aseptically packaged juice. Effective cleaning procedures are essential in controlling microbial contamination. Pasteurization of orange juice is necessary for inactivating enzymes and for destroying microorganisms capable of growing during storage. Enzyme activity leads to cloud loss in single-strength juice and gelation in orange juice concentrate. The relevant enzymes in orange juice require a higher heat load to be inactivated compared to microorganisms. Orange juice is a complex product. A good understanding of the basic nature and properties of orange juice is therefore needed for processing and packaging orange juice. In fact, such knowledge is indispensable for ensuring that high product quality is maintained during juice processing. Section 4 as a whole looks at the principles of processing orange juice that have to be taken into consideration when designing and operating a process plant. It should be stressed that notwithstanding the industry’s extensive experience of processing orange fruit and the large amount of research done on the subject, all the secrets of orange juice have yet to be revealed. Factors which influence juice quality. This subsection takes a look at the impact of raw materials, processing and bulk storage on the quality of orange juice according to Figure 4.1. Considerations involved in maintaining the highest possible product quality during processing are listed in Table 4.1. The effect of packaging and shelf storage on juice quality is discussed in Section 9. The quality of orange fruit is important for the characteristics of the final orange juice product. Oranges are natural products and therefore vary significantly in flavour, vitamin C content and colour according to the variety of orange, the time of season when harvested and the region of the world where they are grown. A prerequisite for initial high juice quality is the use of whole, undamaged oranges with low microbial populations. Juice concentrate is the raw material for the juice packer. The quality of reconstituted juice depends considerably on the quality of concentrate used. This makes it essential to use high-quality concentrate with the desired Brix/acid ratio, colour and sinking pulp content. Its Brix value determines the volume of single-strength juice that can be reconstituted from a given quantity of concentrate. The microbial condition of concentrate is another important factor because high microbial loads demand more intensive pasteurization to achieve the required product stability. The maximum microbial load in concentrate should be specified by the concentrate producer. Water must often be treated before it can be used for juice reconstitution. The degree of treatment depends on the water source. As regards reconstituted orange juice, the quality of water is critical with respect to the content of chlorine, metals, nitrates, salts, air, and so on. Highly alkaline water may affect the acidity of the final product, and excessive solids and minerals will cause a brackish or metallic taste. Chlorine gives water a “pharmaceutical” taste and has a negative influence on juice colour and taste. Both iron and copper catalyze oxidation reactions that result in chemical changes. Microorganisms and organic debris contaminate juice, affect its taste and reduce product shelf life. However, the main spoilage organisms of juice products are not commonly found in water. Despite all the possible effects on juice quality, there are no regulatory standards specifying water quality for beverage production other than that it should fulfil drinking water standards in force in each specific country. Read more about water treatment in subsection 7.3. Processing steps to stabilize extracted orange juice with respect to enzyme and microbial activity are indispensable before concentration, bulk storage, packaging and distribution. One exception is the small quantity of freshly squeezed orange juice that is treated at very high pressure (see section 7.9) or packaged without any treatment at all. In both cases the juice is distributed chilled. The untreated juice has a very short shelf life of up to eight days and often less. Heat treatment with respect to time/temperature settings should be designed to minimize unwanted chemical and flavour changes in the product. Nevertheless it should still give an adequate safety margin for the inactivation of enzymes and spoilage microorganisms. Loss of quality during processing is largely similar to that encountered during packaging and shelf storage. Refer to section 9, Packaging and storage of orange juice, which complements the information presented in this section. At the fruit processor, the loss of vitamin C (ascorbic acid) from orange fruit to frozen orange juice concentrate is generally negligible provided that correct processing conditions and short residence times before concentration and freezing are applied. During orange juice reconstitution and further processing steps, oxygen has an important impact on juice quality. Oxygen is a very reactive element that can induce several changes in the chemical composition of orange juice, the most significant of which is the loss of vitamin C and consequent loss of nutritional value. It is generally agreed that vitamin C degradation in citrus juices can occur through both aerobic (depending on oxygen) and anaerobic (not depending on oxygen) reactions of a non-enzymatic nature. Which of these predominates depends on the temperature and availability of oxygen. During processing, the aerobic degradation of vitamin C predominates. During orange juice storage, both pathways must be taken into account. In aerobic vitamin C degradation, the presence of 1 mg oxygen corresponds theoretically to a loss of 11 mg vitamin C. This calculation is based on the reaction in which vitamin C oxidizes to dehydroascorbic acid. Oxygen is soluble in single-strength juice up to a level of approximately 8 mg/l, which corresponds to a potential loss of 88 mg vitamin C. Assuming an initial vitamin C content of about 450 mg/l, this corresponds to a 20% loss in the nutritional quality attributed to vitamin C. Subsection 9.2.1 gives more information on vitamin C degradation and the impact of different storage conditions. In principle, vitamin C degradation occurs faster as temperature increases, as with many chemical reactions. One might therefore conclude that pasteurization would result in large vitamin C losses. However, the time that the juice is at pasteurization temperature is very short (15-30 seconds). Measurements of vitamin C content in different beverages before and after pasteurization show that vitamin C losses are actually very small. 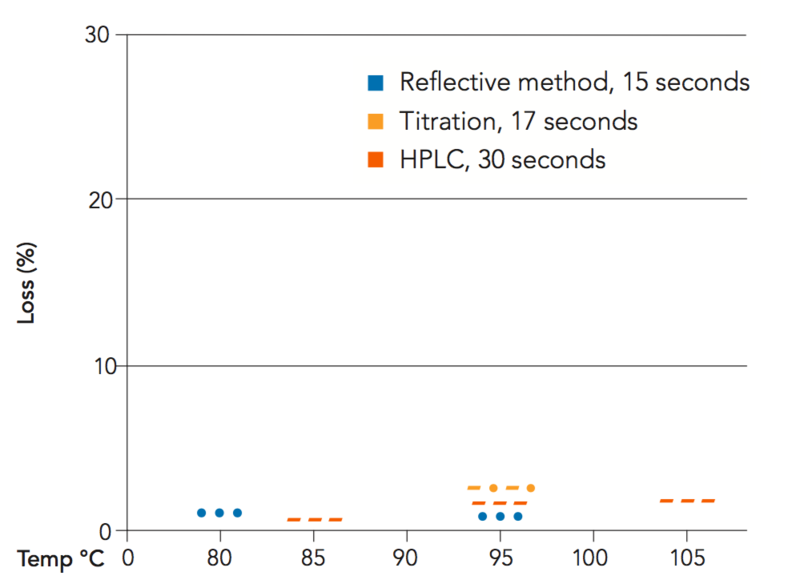 Figure 4.2 shows the results for orange juice at different pasteurization conditions. In the most severe conditions, 105°C and 30 seconds hold time, the vitamin C loss was a mere 2.3%. The evaluations took place both during commercial production and pilot scale trials. Vitamin C losses in orange juice during pasteurization. The desirable taste of freshly squeezed orange juice is easily affected by heat treatment and subsequent bulk storage. The juice may undergo several chemical reactions that can degrade the original volatile flavours of the juice. In addition, off-flavours can be formed mainly from compounds in the aqueous juice matrix. The Maillard reaction, a well-known reaction between sugars (or vitamin C) and amino acids, is an example of this. Several potential off-flavour molecules have been identified in orange juice. Most of these compounds are formed during juice storage, though it takes a long time (several months) or storage at high temperature before any off-taste is noted – that is to say, when the compounds responsible for an off-taste are present in high enough concentration. One exception is 4-vinyl guaiacol (PVG). This compound has been found in concentrations above its perception threshold in newly extracted and processed juice. It imparts an old fruit or rotten fruit aroma to the juice. PVG forms from ferulic acid, an odourless compound normally present in juice. The concentration of free ferulic acid in juice has been shown to double after the first pasteurization step, thereby greatly increasing the possibility of PVG forming. Subsection 9.2.3. explains more about off-flavours. Concentrating orange juice in an evaporator removes the volatile water-soluble and oil-soluble components that provide most of the characteristic orange flavour. The process flavour (also known as “pumpout flavour”) obtained is a combination of the loss of volatile flavour and the cooked taste resulting from heat treatment. These undesired changes can be compensated for by addition of flavour fractions at a later processing stage. During bulk storage the product is kept under conditions that minimize changes in quality. This is of great importance given that storage may be for a year or longer. Demands on storage conditions depend on the orange juice product (FCOJ and NFC) and intended storage time. Orange juice concentrate is bulk-stored at temperatures from -6 to -25°C to avoid degradation of product quality. A temperature of -8 °C is often used during bulk transport. For long-term storage, the lower temperatures are used. Industry experience has shown that this temperature range is needed to avoid changes in colour and taste. At temperatures below -20 °C, concentrate can be stored for several years and still be of acceptable quality. If juice pasteurization prior to concentration is not carried out correctly, the residual enzyme activity can lead to gelation of the concentrate. Pectic substances in the juice form a gel that prevents the concentrate from being reconstituted to a juice of acceptable quality. See subsection 4.4.2. Both forms of storage give a shelf life of at least one year. This longevity is necessary because juice from fruit harvested at different times of the season is blended to obtain consistent quality year-round. Low-temperature storage is important; a temperature around 0°C is low enough to keep the juice from deteriorating while still preserving it as a liquid. An advantage of aseptic NFC storage over frozen NFC is that the juice does not have to be thawed before final packaging. This avoids the use of crushing equipment and high energy consumption to achieve quick thawing. At ambient temperature, thawing takes several days and product quality may deteriorate during this period due to microbial growth and flavour degradation. It is therefore important to prevent air from entering juice during reconstitution and blending of concentrate. If air is present in the juice after reconstitution, it can be removed later in the process. Dispersed air can be decreased by letting the juice rest for half an hour in an open tank before pasteurization. A deaerator can be used to further decrease the air content. A deaerator uses vacuum at ambient or elevated temperatures to remove dispersed and soluble gases from the juice. Nitrogen can be considered as an inert gas with regard to juice quality, whereas oxygen is very reactive and is involved in many reactions that impair quality. It is therefore essential to remove oxygen from juice. The deaeration efficiency is determined by measuring oxygen concentration in the product before and after deaeration. 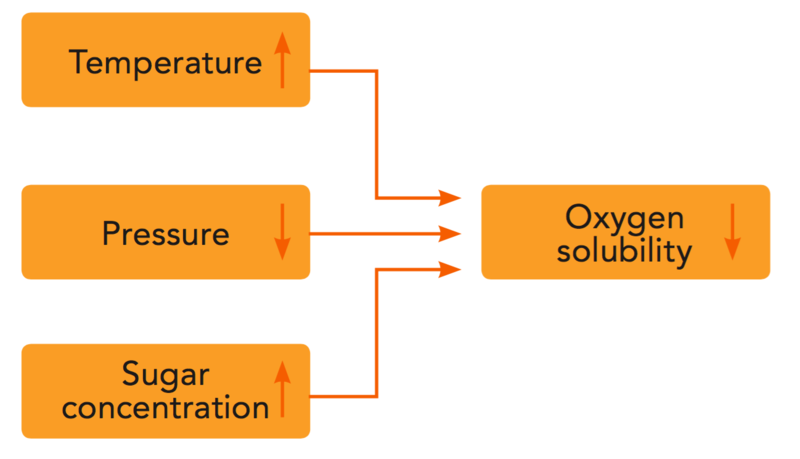 The effect of temperature, pressure and sugar concentration on oxygen solubility. The level of oxygen measured in orange juice can sometimes be higher than its theoretical solubility values. This can be explained by the phenomenon whereby free oxygen adsorbs as gas bubbles to pulp particles in the juice. When solubility decreases due to increased temperature and/or reduced pressure, the gas released does not leave the product but stays as gas bubbles on the surface of fruit cell particles. This adsorption phenomenon appears mainly on large particles in the form of added floating cells, but not on the smaller sinking pulp particles. The main reason for deaerating juice is to reduce its oxygen content. Oxygen is very reactive and promotes many of the reactions that take place in juice during processing and storage and lead to quality degradation. The most important reaction is vitamin C oxidation, which leads to loss of nutritional quality (see subsections 4.1 and 9.2). At the fruit processor, juice is in contact with air during extraction and finishing. Deaeration is essential in the production of NFC for bulk storage, since a high oxygen level will decrease its vitamin C level significantly. Oxygen is less of a problem in the production of concentrate because gases are removed in the evaporator. However, if concentrate is mishandled, a large amount of dispersed air may enter the concentrate. The various steps of reconstituting orange juice from concentrate present a number of entry points for oxygen and air. Nevertheless, optimizing the first process steps to avoid air entry minimizes problems later in the process. 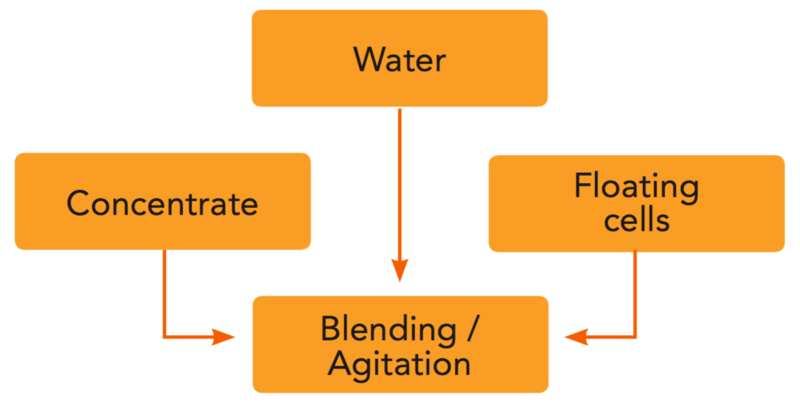 Steps where particular care is needed are: handling of juice concentrate; handling of water; addition of floating cells; flow in pumps and pipes; blending; and reconstitution (Figure 4.5). Concentrate can be a source of gases. Although the solubility of oxygen in orange juice concentrate is low due to the high concentration of soluble solids, the high viscosity of concentrate makes it difficult for free gas bubbles to rise to the surface. Careful procedures are thus important during all concentrate handling steps, including transport, transfer and blending. Water for reconstitution is often a source of high levels of dissolved oxygen. The solubility of oxygen in cold water is about 9 mg per litre (at 20°C). Deaeration of water before reconstitution of juice minimizes dissolved oxygen. It can also eliminate the need to deaerate reconstituted juice. During certain water treatments, the carbon dioxide concentration builds up to levels that cause problems with foaming during the deaeration of juice containing floating cells. Adding floating pulp to juice often increases its gas content. Frozen pulp contains a lot of air, both as air bubbles adsorbed to the surface of pulp particles and as free bubbles that are not released due to the high viscosity of concentrated pulp. Moreover, the agitation required to blend pulp with juice and keep the mixture homogenous in the tank increases the risks of additional gas entry. 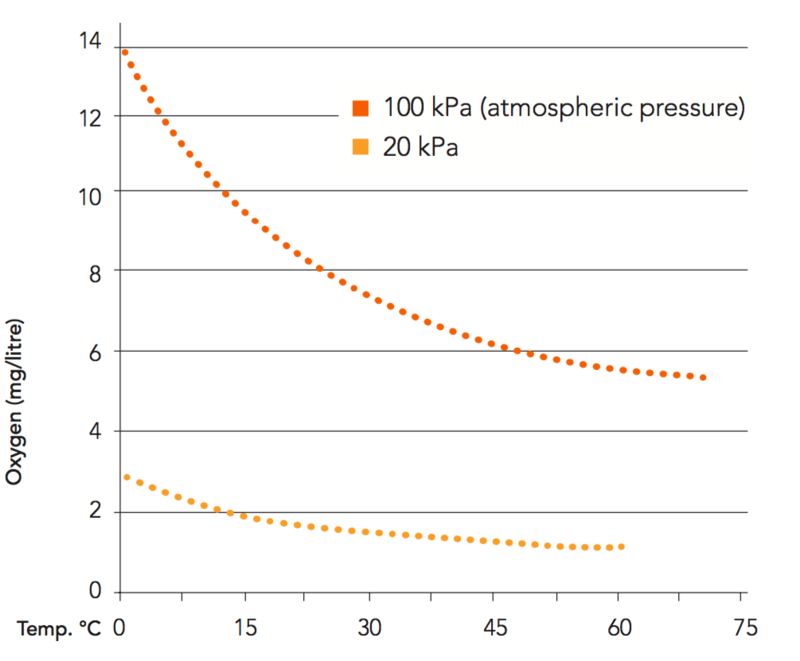 Due to gas bubbles adsorbed to cell particles, measured oxygen content can exceed 9 mg/litre at 20°C. Bad piping design and pumps that are not airtight can be responsible for air entry. It is important to use the right blending and reconstitution techniques. Blending in tanks should be done with low-speed agitators, and the juice should cover the agitator. In some cases, blending is carried out under a nitrogen blanket to prevent oxygen entering the product. Use of in-line blending techniques minimizes oxygen ingress during reconstitution. Tank inlets should be designed to prevent air entry and foaming when the tank is filled. Juice should not be left in blending tanks for long periods before deaeration and pasteurization, because this may lead to impaired quality due to microbial growth and vitamin C loss. Sometimes tanks are blanketed with nitrogen to prevent oxygen entry, especially in buffer tanks containing deaerated juice. If air gains entry during the initial reconstitution steps, it can cause problems later in the process. See Figure 4.6. Gas bubbles adsorbed to floating pulp reduce their density and make them float to the top of juice. This makes it difficult to maintain an even distribution of floating pulp in the blending and balance tanks. Dissolved and dispersed gases are removed in the deaerator. Problems with foaming can occur if the incoming product contains high concentrations of undissolved gas. When juice goes from a higher pressure (in the pipes) to a lower pressure (in the deaerator), gas solubility decreases and bubbles of free gas form in the juice and build up foam. The foam formed in the deaerator and filling machine consists mainly of gas separated by very thin layers of liquid film. The presence of some foam in the deaerator will not affect its performance. But if the deaerator is filled with foam, deaeration becomes insufficient. This problem is mainly found with juices containing floating pulp or a lot of dispersed gas. Ineffective pasteurization can occur if juice contains very high concentrations of dispersed gas (which may lead to reduced residence time or inconsistent heating). If the juice contains floating pulp, gas in the juice can cause poor distribution of particles in the packages (see blending tank). The concentration of dissolved gases in a liquid follows physical laws. One of the more important relationships was defined by the scientist Sir William Henry (1775–1836): a gas that is dissolved in a liquid is in equilibrium with the gas above the liquid surface. This equilibrium is given by Henry’s law. A combination of these two alternatives is often used during deaeration. The partial pressure (PA) is reduced by either using a vacuum (total pressure becomes very low) or by replacing oxygen in the gas phase with another gas. Dispersed oxygen bubbles in juice (without added floating cells) can be removed by leaving the juice in an open tank. The gas bubbles, which have a lower density than the juice, will rise to the top and gradually leave the juice with time. This process can be accelerated by creating a vacuum above the juice. However, it is still a relatively slow process. Dissolved oxygen and oxygen bubbles adsorbed to floating pulp are much more difficult to remove by such a tank process. It is important for the juice to have sufficient residence time in the deaerator to allow the gas to exit the juice. Turning the juice into thin layers of liquid minimizes the distance the gas has to diffuse from the liquid phase to the gas phase and accelerates the rate at which the gas leaves the juice. Concentration of gas A in the liquid phase (mole fraction). Partial pressure of gas A in the vapour phase (Pa). Henry’s constant. It is a function of temperature and depends on the liquid (Pa/mole fraction). Oxygen removal methods include vacuum deaeration and counter-current flushing with an inert gas. Existing methods of deaeration do not remove all oxygen from juice. However, vacuum flash deaeration reduces residual oxygen to levels that no longer have a significant impact on juice quality. Spraying juice through a nozzle or run over packing and/ or trays creates a large surface area for the release of oxygen from the liquid to the vapour phase. Dissolved oxygen then only has a short distance to diffuse to the liquid surface. The finer the nozzle or the more packing/ trays are used, the quicker (and therefore often better) deaeration will be at a given temperature. However, there are practical and cost limitations. Vacuum flash deaeration usually results in about 1% of the liquid being vaporized. As the vapour contains some volatile flavour components, it has to be condensed back into the juice. This can be done using either an internal or external condenser that chills the vapour back to a liquid state. In both cases, the temperature of the cooling water in the condenser and the vacuum applied will determine the extent to which flavour components are condensed. In the gas-stripping type of deaerator, the partial pressure of oxygen in the vapour phase is reduced to almost zero through the displacement of oxygen by another gas, such as nitrogen (N2) or carbon dioxide (CO2). Removing the oxygen in the vapour phase above the liquid forces out the oxygen in the juice into the vapour phase. This process does not reduce the total gas content of the juice but replaces oxygen with another gas. There are several types of stripping system. In one type, the liquid and the gas meet in countercurrent flow as they pass through a packed column. In a another, the liquid is sprayed into a room filled with gas, or the gas is sprayed into the liquid stream before the deaerator vessel. The growth of microorganisms in orange juice is characterized by fermentation and/or the production of off-flavours that spoil the product. Fermentation may lead to gas formation, which, in turn, results in blown packages. 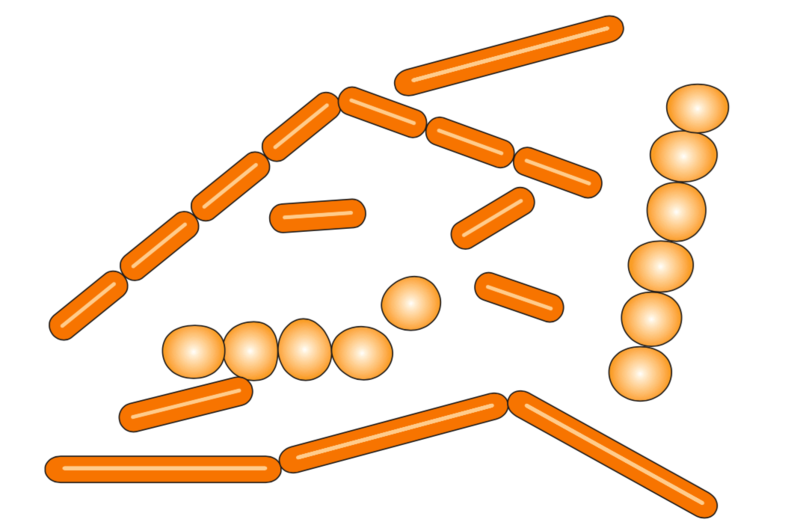 Lactic acid bacteria belonging to the genera Lactobacillus and Leuconostoc are the most common of the acid-tolerant bacteria that cause spoilage of orange juice (see Figure 4.7). Spoilage is characterized by a “buttery” or “buttermilk-like” flavour resulting from the formation of diacetyl during bacterial growth. Leuconostoc and many species of Lactobacillus also produce large volumes of CO2. Most lactic acid bacteria grow best in orange juice at temperatures between 20 and 37°C. Their rate of growth is greatly reduced above or below these temperatures. Growth is very slow at 4°C in single-strength juice. These bacteria are sensitive to heat and high osmotic pressure (high juice concentration); no growth is observed in juice above 45°Brix. Lactic acid bacteria pose the biggest problem during the processing steps prior to concentration. After extraction, the juice has to be refrigerated or heat-treated as soon as possible to prevent large build-ups of these bacteria. It is also important for fruit processors to maintain an effective programme of sanitation. The main species of lactic acid bacteria that cause spoilage are Lactobacillus plantarum, Lactobacillus brevis, Leuconostoc mesenteroides and Leuconostoc dextranicum. Cells that are busy multiplying. They are more easily inactivated than spores of the same species. Dormant cells, with thick walls, that can withstand adverse environmental conditions for long periods. One of the ways that yeasts reproduce. 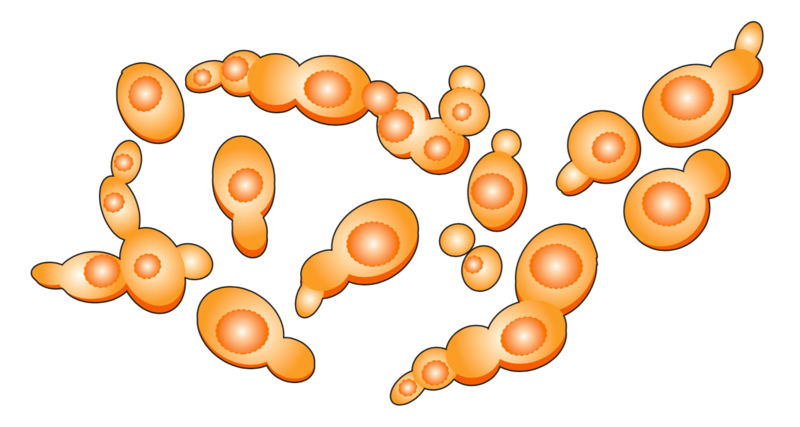 Yeasts (see Figure 4.8) are the most common type of spoilage organism in both single-strength and concentrated orange juice. Spoilage of orange juice by yeasts typically results from an alcoholic fermentation that leads to off-flavours and CO2 production. Yeasts not capable of alcoholic fermentation may cause turbidity, flocculation and clumping in juice. The optimal growth temperature for most yeasts is 20–30°C. Yeasts are more tolerant of cold temperatures, high osmotic pressure and lack of nutrients than lactic acid bacteria or moulds. Yeast species can easily survive in citrus concentrates of 58 to 65°Brix and in frozen juices. Saccharomyces cerevisiae, Rhodotorula spp. and Zygosaccharomyces spp. are the most common yeasts found in juice. Saccharomyces cerevisiae is most commonly associated with the spoilage of pasteurized citrus juices. The presence of Rhodotorula may be indicative of poor post-pasteurization hygiene. Zygosaccharomyces is an osmophilic yeast, which means that it can survive the high osmotic pressures and low water activity of concentrated orange juice. It is frequently associated with spoilage of concentrates. Yeast can form ascospores as a way to reproduce. The yeast spores are more heat-resistant than the vegetative yeast cells. Moulds form colonies of aerial mycelia on the surface of juice, and flocculation or floating mycelia within juice (see Figure 4.9). They can grow under a wide variety of conditions. In general, moulds grow well in acid media and require abundant oxygen. Moulds that grow in orange juice are generally sensitive to heat treatment and are thus easily destroyed by pasteurization. Compared with yeasts and bacteria, moulds have only infrequently been associated with orange juice spoilage. This is because of their aerobic (oxygen-dependent) nature and slow growth rates. However, with the advent of long-term chilled storage of single-strength juice and extended shelf life of juice in non-aseptic cartons with low oxygen barriers, mould growth in citrus juice has become a more important issue. Moulds may give rise to concern during juice extraction when fruit handling and juice room equipment are not kept hygienic. When the correct approach to sanitation s neglected, moulds colonize the surfaces of conveyor belts, fruit bins, extractors and other equipment. These conditions promote the contamination of juice or the surfaces of containers. Some moulds that have been isolated from orange juice are: Aureobasidium pullulans, Aspergillus niger, Botrytis spp, Fusarium spp., Geotrichum spp., Mucor spp., Aspergillus fumigatus, Cladosporium spp. and Penicillium spp. Some other mould species can form special forms of spore that are very heat-resistant. They include Byssochlamys fulva, Neosatorya cheri and Talaromyces flavus and may occur in orange juice if unsound, mouldy fruit enters the fruit processing plant. These spores are not inactivated at normal pasteurization temperatures, but because they are rarely found in orange juice they are not taken into consideration when establishing processing conditions at the juice packer. The presence of pathogenic (disease-causing) microorganisms in orange juice is rare, since the low pH of juice inhibits growth of pathogens. However, a few species that may cause serious food poisoning even at very low concentrations can survive for some time at low pH. Listeria monocytogenes, certain Salmonella species and Escherichia coli O157:H7 are of particular concern in this context. These bacteria are readily inactivated during pasteurization but may be present in unpasteurized juice or juice contaminated after heat treatment. Overall, diseases attributed to orange juice are mainly caused by incorrect product handling and can be prevented by carrying out approved sanitary procedures, juice pasteurization and by preventing post-pasteurization product contamination. Bacteria can form heat-resistant spores, but most spores cannot germinate (and thus multiply as bacteria) in fruit juices with a pH below 4.6. However, the spores of the acidophilic (acid-loving) Alicyclobacillus are a notable exception. These bacteria were first isolated from shelf-stable juices in the early 1990s and classified in a new genus. 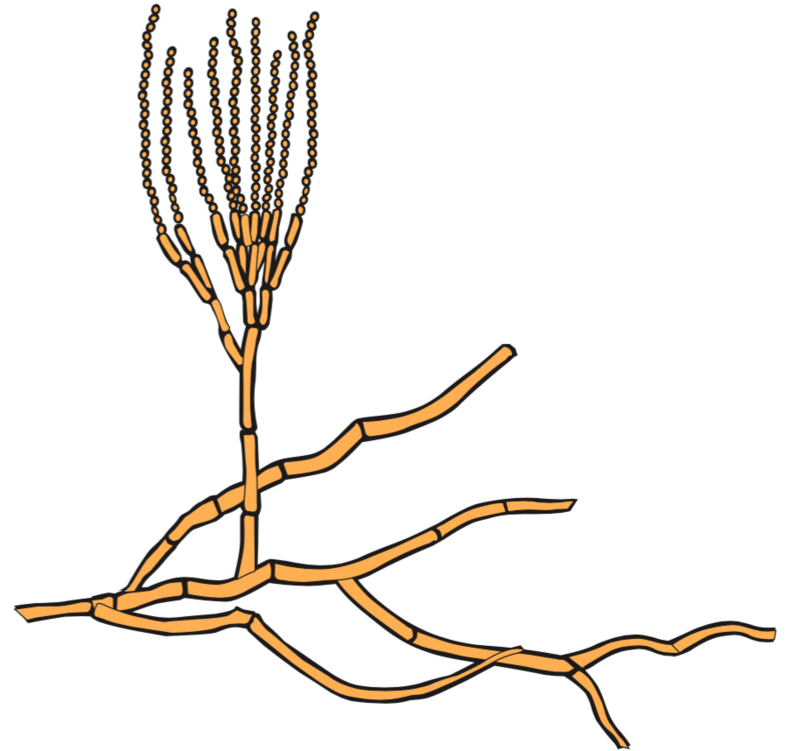 Bacteria belonging to this genus prefer thermophilic temperatures and grow best around 45°C. It is unlikely that they will grow at temperatures below 20°C. The most likely source of fruit juice contamination is fruit contaminated with soil during harvesting. Such contamination is introduced into the manufacturing process through unwashed or poorly washed fruit. Proper handling and treatment of wash water is important to prevent the accumulation of Alicyclobacillus spores in the fruit processing plant. If condensate from the evaporators is reused as wash water, it should be cooled or sanitized to prevent thermophilic bacteria growth. Alicyclobacillus are not pathogenic. They cause spoilage primarily by imparting off-flavours to the juice. These are often described as resembling “disinfectant” or guaiacol. Alicyclobacillus spores require temperatures much higher than pasteurization conditions to be inactivated. It is therefore important to prevent them from entering the juice packing plant. Rapid detection tests have been developed to verify that juice concentrates and other raw materials are free from Alicyclobacillus spores. The beverage industry sometimes uses the term TAB for thermo-acidophilic bacteria. Alicyclobacillus are the most common among TABs. The microflora of different orange juice products can vary widely according to the state of the raw fruit, and juice processing and storage conditions. FCOJ is not aseptic or commercially sterile. It can contain a highly diverse microflora including yeasts, moulds and bacteria. However, frozen orange juice concentrate does not have any significant microbial problems because it is stored frozen: though alive, the microorganisms cannot grow. Concentrated orange juice quite often has a total microbial population of 100 to 1,000 organisms/ml. In general, an acceptable microbial quality of concentrate is a total viable count lower than 1,000/ml. For yeasts and moulds, the acceptable figures are in the range of 100/ml and lower than 10/ml, respectively. When concentrate is exposed to temperatures above freezing point, osmophilic yeasts like Zygosaccharomyces spp. are the primary spoilage organisms. As yeasts represent the dominant microflora of any consequence in concentrate, it is most likely that they will retain this status in juice reconstituted from concentrate. If reconstitution is not carried out under appropriate sanitary conditions, the type and number of microorganisms in the end product will increase. Microorganisms normally present in the surrounding air and water, and on equipment, can contaminate juice. Juice should not be held in tanks for long periods of time before pasteurization. Whenever concentrate is reconstituted to single-strength juice, microorganisms that were dormant in the concentrate suddenly have the conditions that allow them to grow rapidly. After dilution of concentrate but prior to pasteurization, juice is held in tanks at as low a temperature as possible. The tanks require proper cleaning procedures to prevent them from becoming a source of contamination. After pasteurization, NFC is either filled directly into consumer packages or, more often, stored in bulk for a period of time under chilled aseptic or frozen conditions. Generally, microbial spoilage of pasteurized single-strength juice sold chilled under non-aseptic conditions is due to fermentative yeasts. The most common spoilage organism in this product is Saccharomyces cerevisiae, although other yeasts have occasionally been isolated as well. The microflora of NFC strongly depends on juice storage temperature. At temperatures ≤7°C, yeasts are the predominant flora responsible for spoilage, whereas at ≥10°C lactic acid bacteria outgrow the yeasts and become the main spoilage organisms. The main species present are lactic acid bacteria, such as Lactobacillus spp., Leuconostoc spp., and yeasts like Zygosaccharomyces spp. and Saccharomyces cerevisiae. The total number of microorganisms in this product varies throughout the season and is strongly dependent on the condition of the fruit and sanitation of the processing equipment. In general, higher counts are observed with mature oranges that have a higher Brix/acid ratio. Much higher counts are observed with unsound fruit. The hygienic condition of the processing plant will also influence the number of microorganisms present in juice. In general, freshly squeezed orange juice has a total microbial count ranging from 1,000 to 10,000 organisms/ml. However, this number may be as high as 32,000,000 organisms/ml in juice extracted from poor-quality oranges in processing plants with bad sanitation. Microorganisms found in nature will enter the processing plant via fruit, soil, animals and people. Their number will vary depending on harvesting method as well as handling en route from the groves to the processing plant. Out of the diverse array of microorganisms, only those species capable of growing during the production of orange juice are of prime concern. These are lactic acid bacteria, yeasts and moulds. A correlation exists between the percentage of defective fruit entering a processing plant and the contamination of extracted juice. To minimize microbial contamination within a plant, fruit must be carefully graded and washed effectively. In some cases, fruit is treated with detergent to minimize surface microorganisms. All unsound fruit should be removed. Washing is usually done with (chlorinated) water sprays located at strategic points on conveyor belts and elevators. The sprays must completely cover the entire width of the belt or else microorganisms will accumulate at the belt edges. Washing efficiency has a direct bearing on the microbial population of extracted juice. Effective cleaning procedures are essential in controlling microbial contamination in the production of orange juice concentrate, as well as during reconstitution of concentrate to produce single-strength orange juice. Frequent cleaning during everyday production. This is necessary to maintain surface hygiene. Intermittent-type cleaning while plant is in operation, or cleaning parts of the plant temporarily taken out of production to enable proper cleaning. General cleaning of the plant. This occurs during a complete plant shutdown. Flushing with chlorinated water is generally performed periodically to control microbial contamination while the plant is in operation. Floors should not be cleaned during operation of the production line because this can spread microorganisms. Cleaning-in-place (CIP) systems that greatly improve the efficiency of cleaning are now generally used by processing and packaging plants. See also subsection 7.9. The purpose of pasteurization is to make the juice product stable during subsequent processing and storage. Pasteurization of orange juice is necessary to destroy the microorganisms capable of growing during storage, and for inactivation of enzymes to prevent cloud loss. Enzymes are proteins that catalyse biological reactions. They are necessary for the growth of all living matter. Orange juice is pasteurized at least twice before it reaches the consumer (except for a small volume of NFC that is filled directly into consumer packages after the first pasteurization). The first pasteurization occurs immediately after extraction prior to bulk storage, and the second pasteurization occurs before packaging (see Figure 4.10). The first pasteurization is required to completely inactivate the enzyme pectin methyl esterase (PME), also known as pectin esterase (PE), which will otherwise cause cloud loss of single-strength juice and gelation of concentrate during storage. Microorganisms of commercial interest are also killed by this process. The second pasteurization destroys any microorganisms that may have contaminated juice after the first pasteurization step and survived bulk storage, as well as those which may have contaminated juice during its reconstitution from concentrate. Enzymes are proteins produced by living organisms specialized in catalyzing biological reactions. They are therefore sometimes called biocatalysts. Enzyme action is specific; each type of enzyme catalyzes only one type of reaction. The action of an enzyme is also strongly influenced by temperature and pH. The ba- sic function of an enzyme that breaks down a larger molecule into smaller ones is illustrated in Figure 4.11. The enzymes in orange juice come from the fruit itself. They are firmly associated with the cell wall fractions and therefore are mainly derived from parts of orange like peel, rag and juice sac tissue (pulp). Enzymes are released from the fruit solid phase (membranes) into the liquid phase (juice) during the extraction process. Cloud loss of single-strength juice and gelation in concentrate are mainly caused by pectin methyl esterase, which is present naturally in fruit. PME is mainly active in the temperature range from 5°C to 65°C and shows maximum activity at 60°C. Above 60°C its activity gradually decreases. The activity of the enzyme at temperatures below 5°C is low, but it is still enough to cause cloud loss in single-strength orange juice. Even at a temperature as low as -18°C the reaction rate is high enough to cause gelation of concentrates during storage. In order to prevent cloud loss or gelation during processing and storage of orange juice, it is necessary to inactivate PME. Although several methods have been tested, pasteurization is the only process used industrially to inactivate the enzyme. Among the varieties of oranges from Florida (Valencia, Pineapple and Hamlin), the heat stability of PME was highest in juice from Valencia oranges, and similar in juice from Pineapple and Hamlin oranges. Figure 4.12 shows the decimal reduction time for PME, at different temperatures in juice from Valencia oranges grown in Florida. 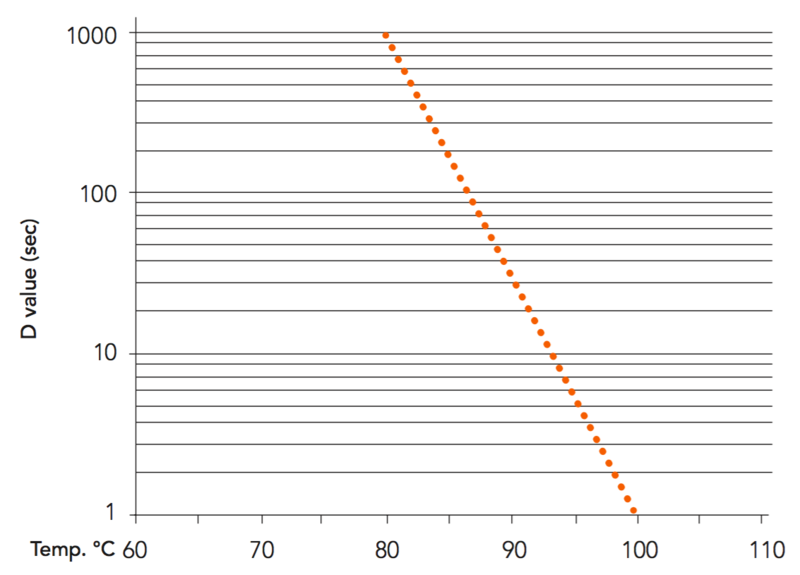 The D value corresponds to 90% enzyme inactivation. A heat load corresponding to 2-3 D values is generally sufficient for enzyme inactivation. Among orange varieties from Brazil (Pera Rio, Pera Coroa, Natal and Valencia), PME in Valencia and Pera Rio juice had the highest heat resistance, requiring 2 minutes at 90°C for complete inactivation, whereas PME in Pera Coroa and Natal varieties was inactivated after 1.5 minutes at 90°C. Juice with higher pH requires a more intensive heat treatment to inactivate PME than juice with lower pH. The influence of pH on thermal inactivation of PME is dependent on fruit variety. Orange juice from the Pineapple variety showed the highest sensitivity to pH changes, followed by Valencia. As PME is associated with cell wall materials, a higher heat load is required in juices with higher pulp content. An increase of pulp content from 5% to 10% increases by about 2.5 times the time required at a given temperature to inactivate PME. Decimal reduction time (D value) at different temperatures for PME in Valencia orange juice at pH = 4.1 and with 12% pulp content. The most common reason for cloud loss or gelation in orange juice is the enzymatic breakdown of pectin molecules in the juice. Pectin is a complex organic substance (consisting mainly of partially methylated sugar units) that exhibit important properties, such as the ability to form emulsions and to increase liquid viscosity. In single-strength orange juice, pectin is one important constituent of the cloud. The cloud of orange juice contributes to its visual appearance (opacity) and viscosity. Viscosity is essential for good juice “mouthfeel”. 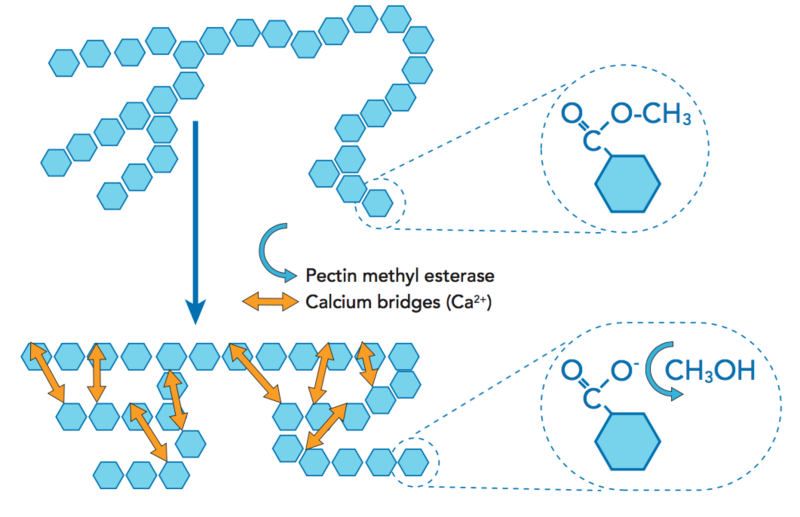 The enzyme breaks down pectin by removing methyl groups from the sugar units. The resulting molecule reacts with calcium (naturally present in the juice) to create bridges between the sugar units, see Figure 4.13. The insoluble molecule formed is called calcium pectate. In single-strength juice, calcium pectate settles to the bottom of the package. This causes the juice to separate into a clear upper phase and a lower sediment phase. This separation is referred to as cloud loss. In orange juice concentrate, calcium pectate forms gel-like lumps due to the high sugar and acid content. This gelation makes it impossible to reconstitute to orange juice of good quality. The heat resistance of microorganisms is affected by factors like pH, water activity and oxygen. Reducing microorganism concentration is more efficient under conditions not favourable for their growth. In general, moulds are less resistant to heat than yeasts and yeasts are less resistant to heat than bacteria. The yeast Saccharomyces cerevisiae is the most common spoilage organism in citrus juices. It can form ascospores that are much more heat-resistant than its vegetative cells. In orange juice, PME is more heat-resistant than the microorganisms commonly present in orange juice. This means that a more intensive time-temperature treatment is necessary to inactivate the enzyme than to destroy microorganisms. Orange juice should be pasteurized to inactivate PME as soon as possible after extraction. It is pasteurized above 95-98°C for 10-30 sec. This can be done as a separate step or as a first step in the evaporator. The second pasteurization, carried out prior to juice packaging, involves NFC after bulk storage or juice reconstituted from concentrate. The purpose is microbial destruction rather than enzyme inactivation. Because microorganisms are less heat-resistant than enzymes, the second pasteurization may be carried out at a lower temperature. The required time-temperature combination for the second pasteurization will depend on the total number of microorganisms in the juice sent to the pasteurizer. This population of microorganisms depends on the initial number in the concentrate, residence time in tanks before pasteurization and the standard of plant sanitation. The use of heat for a given period of time is a method of food preservation used to destroy microorganisms, enzymes and heat-labile toxins. Pasteurization and sterilization are two types of thermal processing. Sterilization destroys all living microorganisms includ- ing microbial spores, whereas pasteurization kills the majority of vegetative microorganisms, particularly pathogenic bacteria, but has little or no effect on bacterial spores. Pasteurization is generally adequate heat treatment for high- acid juice foods. D value, or decimal reduction time, is the time required at a given temperature to decrease the population of a specified microorganism by 90% or one log cycle. For example, D80 = 1 minute means that it takes 1 minute at 80°C to destroy 90% (or one logarithmic reduction) of the specified microorganism. This is the change in temperature needed to alter the D value by one log cycle. For example, if an organism hasaz=5°CandaD80 °C =1minute,theD85°C =0.1 minutes and the D75 °C = 10 minutes. Temperatures around 95°C for 15-30 seconds are commonly used by the industry for the second pasteurization of orange juice reconstituted from concentrate and intended for storage at ambient temperature. However, studies performed by Tetra Pak have shown that it is possible to lower the pasteurization temperature in order to save energy. As already mentioned, Saccharomyces cerevisiae is the most common spoilage agent in orange juice. This species of yeast produces ascospores, a more resistant form of yeast cell. Based on the heat-resistance of this microorganism, (D60 = 3-19 minutes), a heat treatment of 80°C for 15 seconds will be adequate to sufficiently reduce the microbial population (second pasteurization) provided that the raw material is of good quality. These theoretical values have been validated in both pilot tests and industrial production conditions. When aseptically packed, the juice can be stored under ambient conditions. 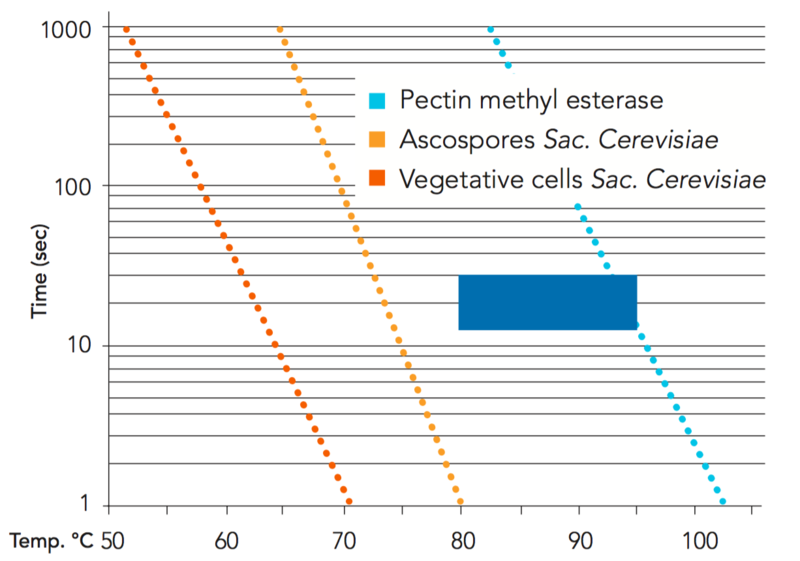 Figure 4.14 shows the theoretical thermal destruction curves of pectin methyl esterase, and of ascospores and vegetative cells of Sac. cerevisae in orange juice. All temperature/time combinations to the right of the ascospore curve are sufficient for 10 decimal reductions or more. The blue square shows the time/temperature combinations used mainly by the industry today. Since microorganisms grow much slower at chilled than at ambient temperatures, chilled juice can be sold as a non-aseptic product, i.e. non-aseptic filling and packaging can be used. However, the pasteurization step must ensure that microorganisms in the juice will not spoil it during its intended shelf life. More intensive time-temperature treatment is necessary to inactivate the PME enzyme than to destroy microorganisms.